Background & Objective: Ketamine, a noncompetitive NMDA receptor antagonist, exhibits rapid antidepressant actions, but the underlying mechanism remains obscure. AMPA receptor and cAMP response element-binding protein (CREB) are involved in the antidepressant actions of Ketamine and imipramine, a traditional tricyclic antidepressant. However, ketamine exerts its therapeutic actions much faster than imipramine. Understanding the discrepancy of antidepressant efficiency between ketamine and the traditional antidepressant is important for elucidating the mechanism underlying ketamine’s fast-acting antidepressant responses as well as designing new rapid antidepressants. Results: Here we show that the enhancement of the phosphorylation of CREB Ser133 and expression of CREB and glutamate receptor 1 (GluR1) are necessary for both ketamine’s and imipramine's antidepressant actions, but the enhancements at early stage may account for the faster onset of ketamine's antidepressant action than imipramine. 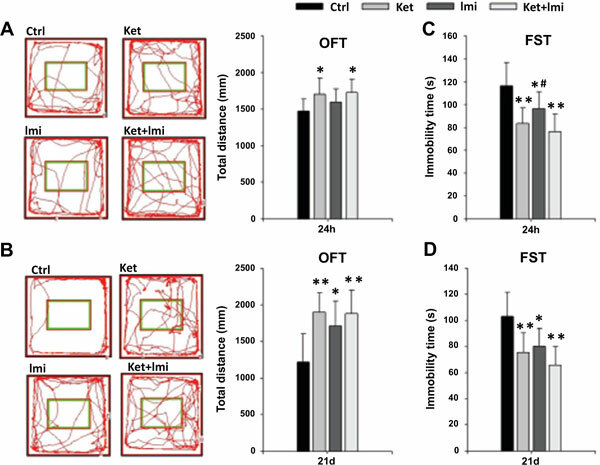 Notably, ketamine but not imipramine enhances CREBregulated transcription coactivator-1 (CRTC1) expression and induces potentiation of excitatory synaptic transmission at Schaffer collateral CA1 synapses, which indicates critical targets for unveiling ketamine's rapid antidepressant actions. Conclusion: Our study suggests that differential regulation of CRTC1 expression may contribute to the discrepancy of antidepressant efficacy between ketamine and imipramine, which may lead to a better understanding of ketamine's fast antidepressant responses. Keywords: cAMP response element-binding protein, CREB-regulated transcription coactivator 1, depression, glutamate receptor 1, imipramine, ketamine. Keywords:cAMP response element-binding protein, CREB-regulated transcription coactivator 1, depression, glutamate receptor 1, imipramine, ketamine. Abstract:Background & Objective: Ketamine, a noncompetitive NMDA receptor antagonist, exhibits rapid antidepressant actions, but the underlying mechanism remains obscure. AMPA receptor and cAMP response element-binding protein (CREB) are involved in the antidepressant actions of Ketamine and imipramine, a traditional tricyclic antidepressant. However, ketamine exerts its therapeutic actions much faster than imipramine. Understanding the discrepancy of antidepressant efficiency between ketamine and the traditional antidepressant is important for elucidating the mechanism underlying ketamine’s fast-acting antidepressant responses as well as designing new rapid antidepressants.